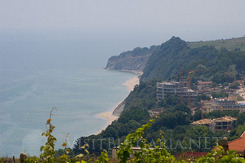 The small town of Byala is situated on a picturesque coast on the Black sea. It is a rich wine center, with traditions in the wine industry that date back from ancient times. It is located 50 kilometers south of Varna and 80 kilometers northeast of Bourgas. Byala is a nice sea resort with wide beaches, a lot of holiday homes and a beautiful water slide. A small port lies on the coast of Byala. It provides opportunities for small ships and yachts to land on the beautiful coast of Byala. The resort is also interesting for its ethnographic complex that preserved a lot of traditional Bulgarian exponents. Another opportunity is a visit to a rural local house where tourists can experience authentic, traditional customs. Horse lovers can also find a chance to practice their favorite sport in the site. The demonstration center “White rocks” is a must for everyone who visits this beautiful town. It offers demonstrations of the formation of the unique white rocks. On the coast tourists can distinct the remains of one of the biggest ancient Bulgarian protective banks from VIII-X century. Close to the town can be seen the remains of a late antiquity fortress.